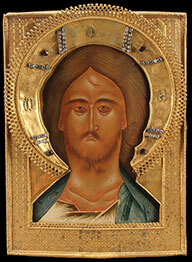 A VERY FINE RUSSIAN ICON OF THE FIERCE EYE CHRIST, MOSCOW, 18TH CENTURY. Although the title "Fierce Eye" was often used when speaking of icons painted like the offered icon, generally speaking the term was rarely written on icons as a title whereas the more standard title, The Lord Almighty (Gospod Vsederzhitel) was used. This type is distinguished from of the standard Lord Almighty image by the shoulder length or bust profile composition as well as the hair of Christ which flows behind him as seen over his left shoulder. The expression Fierce Eye is meant to convey an aspect of Christ not so much as a comforter but rather as a judge which justice demands rewards the righteous and punishes the wicked. The halo exhibits the cross form and the abbreviated Greek expression HO ON meaning WHO IS, as taken from the book of Revelation 1:8. The overall quality of this icon and the state of preservation is excellent. The entire image is overlaid with a high quality repousse gilded copper riza with attached halo embellished with paste stones. The size of the icon and panel construction is interesting. It is constructed with a central single spline inserted in the back, something generally seen of earlier icons, and is of a slightly smaller than standard size, measuring 11.2 inches x 8.25 inches (28.2 x 21 cm). 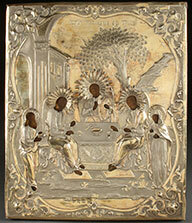 A SCARCE RUSSIAN ICON OF CHRIST EMMANUEL WITH ANGELS, 18TH CENTURY. An early example of this type held by the Tretyakov Gallery, Moscow, dates back to the pre-Mongol period of the 12th century. It is sometimes referred to as the “Angelic Deisis.” Others just call it “The Savior Emmanuel with Angels.” Although no inscriptions remain on the Tretyakov example the two angels are generally identified by their clothing as the Archangel Mikhail and Gabriel. Another similar but later example attributed to 17th century iconographer Ivan Dyakonov, which is currently housed in the Church of Elijah the Prophet in Yaroslavl, and dated to circa 1650, identifies specifically with period inscriptions the two angels as Mikhail and Gabriel. At center in this example is seen a bust image of Christ Emmanuel (Christ as a youth). He is flanked on either side by angels, presumably Mikhail (left) and Gabriel (right). His title is taken from Isaiah 7:14: “Behold, a virgin shall conceive, and bear a son, and shall call his name Emmanuel.” The word Emmanuel is the Greek form of the Hebrew meaning God is with Us. Emmanuel is a representation of the Son, “begotten of the Father before all worlds". 13 inches x 29.5 inches (33 x 75 cm). A LARGE AND IMPRESSIVE RUSSIAN ICON OF THE TIKHVIN MOTHER OF GOD, CIRCA 1600, MOSCOW. The corners of the upper margins with small circular plaques displaying small plaques displaying the standard abbreviated Greek title MP OY (Meter Theou) for the Mother of God. She bears a star upon each shoulder and on her head, signifying her perpetual virginity before, during and after the birth of Christ. Above the head of Christ the standard Greek abbreviated title ICXC - ISUS KHRISTOS. Christ delivers a blessing with His right hand and holds a scroll (signifying His wisdom) in His left hand. The Virgin gestures towards Christ, directing the viewer to the source of eternal life-her son, Christ Jesus. The upper corners painted with Angels of the Lord. The borders and background overlaid with silver repousse basma strips and the haloes similarly decorated. 20 inches x 18 inches (51 x 46 cm). 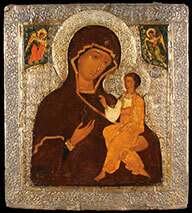 A VERY FINE RUSSIAN ICON OF THE VLADIMIR MOTHER OF GOD, 16TH CENTURY, MOSCOW. Typically depicted in half length, here the Virgin holds the Christ child in a tender cheek-to-cheek embrace, her head inclined towards the Christ child, who embraces her with both hands. The Virgin with a reddish-brown maphorion edged in gilt highlights over a dark blue chiton with white highlights, executed on a gilt ground panel with double kovcheg and single spline. 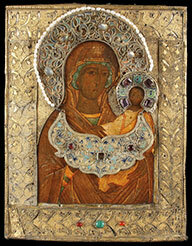 The offered icon follows closely two separate icons of the Vladimir Mother God both held in the Moscow Kremlin Assumption Cathedral, one dating to the 15th century, the other to the beginning of the 16th century. 12.8 inches x 10.5 inches (32.5 x 26.5cm). 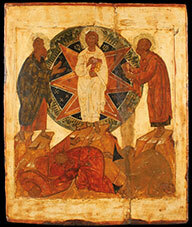 A RUSSIAN ICON OF THE TRANSFIGURATION, END OF THE 16TH CENTURY, SUZDAL-VLADIMIR REGION. Of noble proportions, finely drawn and with well-ordered composition which is derived from early 14th century models. The calm composure of Christ who stands in white garments holding the Gospels between the Old Testament Prophets Elijah and Moses contrasts with the agitated drama of the Apostles (James, John and Peter) who fall headlong before the unbearable vision of the uncreated light. The theme of the Transfiguration is of crucial importance for Eastern Christian art and thought. For just as the Festival of the Nativity manifests the entry of the spirit into matter and into time – the sanctification of all human and natural existence through the Incarnation – the Transfiguration elucidates the corollary; how matter, illuminated by divine energy, may recover its own untarnished beauty – the original beauty of the cosmic image obscured by the Fall. The same idea is expressed in patristic thought: thus: “God became Man in order that Man might become God” (St. Athanasius). And exactly the same transfiguring process is evidenced by the Deifying Energies that transmute the Eucharistic Bread and Wine into Christ’s Body and Blood. 20.5 inches x 17.5 inches (52 x 44.5 cm). A RUSSIAN ICON OF THE ANNUNCIATION, CIRCA 1600. Of good size, and composition, here the Archangel Michael depicted at left announces (BALGOVYESHCHENIE)-the good news, of the coming birth of Christ to Mary who is shown seated at right. At top center a dove, symbol of the Holy Spirit is shown descending from above, Luke 1:35, “And the angel answering, said to her: The Holy Ghost shall come upon thee, and the power of the most High shall overshadow thee. And therefore also the Holy which shall be born of thee shall be called the Son of God.” The larger size and shape of this icon would clearly suggest that it was an icon that once formed part of the festival tier in an iconostasis. The Annunciation is one of the twelve great Church feast days celebrated on March 25th (April 7th Western calendar). 21 inches x 15 inches (53.5 x 38 cm). 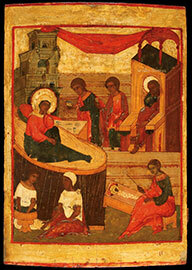 A FINE RUSSIAN ICON OF THE BIRTH OF THE MOTHER OF GOD, 16TH CENTURY, VLADIMIR-SUZDAL. Of larger size and good proportions. At left Anna, the mother of Mary, is depicted reclining on a bed after having given birth. Following Jewish tradition, servants at the foot of the bed, wash the newborn Mary and swaddle her and cool her with a fan shown lower right. Behind Anna are two servants serving her food and further back still and to the right is Anna’s husband Joakhim who looks on. The draped red cloth along the upper margin strung between two buildings indicates that this is an interior scene. The Birth of the Most Holy Mother of God is one of the twelve great Church feast days celebrated on September 8th (September 21st Western Calendar). 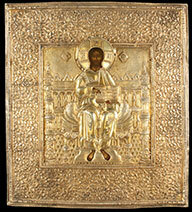 The size and shape of the offered icon would suggest it once formed part of the festival tier of an iconostasis. 19.5 inches x 13.5 inches (49.5 x 34.5 cm). 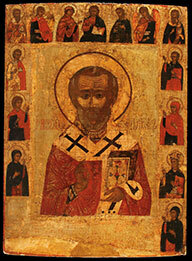 AN INTERESTING RUSSIAN ICON OF ST. NICHOLAS WITH DEISIS AND SAINTS, 16TH CENTURY, PSKOV. Here Nicholas is traditionally depicted as a bishop, delivering a blessing and holding a book of Gospels. The upper border is painted with an extended Deisis and the left and right borders are painted with selected saints. 14.5 inches x 10.6 inches (37 x 27 cm). 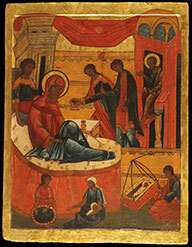 A LARGE RUSSIAN ICON OF THE BIRTH OF THE MOTHER OF GOD, CIRCA 1500, WITH LATER RESTORATIONS. Here Anna, attended by servants, reclines on a bed after giving birth to the Virgin Mary shown below in two scenes; being washed (lower left) and being rocked in a suspended cradle (lower right). At upper right, Joakhim, husband of Anna and father of Mary looks on. The large size would surely indicate that the offered lot was once likely incorporated into the festival tier of an iconostasis. 34 inches x 26 inches (86 x 66 cm). 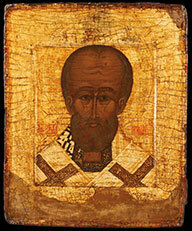 A RUSSIAN ICON OF SAINT NICHOLAS, 16TH CENTURY, MOSCOW. Here Nicholas is depicted in bust portrait form, his sakkos with cross decorations and collar with gilt embroidery. The omophorion also with gilt decorated crosses. The painted surface in very good condition retaining 95% of the original pigments, and executed on a typical earlier style panel with double raised kovcheg. 11.5 inches x 9.3 inches (29 x 24 cm). 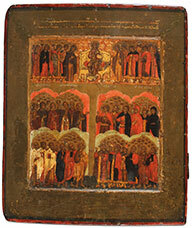 A VERY RARE RUSSIAN ICON OF “THE SATURDAY OF ALL SAINTS", STROGANOV SCHOOL, 17TH CENTURY. The upper border inscribed with a lengthy liturgical prayer and immediately below the Deisis, depicting Christ enthroned at center with the Mother of God on the left and John the Forerunner on the right. Further out still the archangels and other ranks of angels. The lower section divided into four reserves and each reserve with two groups of saints identified by the inscriptions above their heads. On the left, “Choir of Venerable Women” and next to them, “Choir of Venerable Fathers.” At the same level on the right are, “Choir of Holy Martyrs” (male) and “Choir of Holy Martyrs” (female). At lower left is, “Choir of Holy Fathers” and “Choir of Holy Apostles.” On the right, “Choir of Holy Prophets” and next to them “Choir of Holy Forefathers.” 14.2 inches x 12 inches (36 x 30.5 cm). 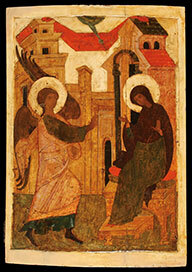 A FINE AND INTERESTING RUSSIAN ICON OF THE ANNUNCIATION, 16TH CENTURY. On the left is the Archangel Gabriel with large peacock styled feathered wings holding a trident form staff upon which rests a disc within a cloud emblazoned with the Greek abbreviation IC – for Jesus and thus signifying the sovereignty of the bearer acting therefore as a seal of Christ. He announces the good news (BLAGOVYESHCHENIE) to Mary of the forthcoming birth of Jesus. At center a hole in the ground represents a well. It is based on the Protoevangelion of James that relates a story that Mary went out to draw a pot of water from the well and as she did she heard the words of the Archangel’s greeting but saw no one; so she returned to her spinning in the house where Gabriel appeared to her and repeated his greeting. A faint image of the infant Christ is rendered upon the chest of Mary signifying the conception by the Holy Spirit depicted as a downward flying dove within a ray of light emanating from God the Father who is seated on His heavenly throne surrounded by seraphim and cherubim on the upper central margin. Interestingly, God the Father (GOSPOD SAVVAOF)- Lord Sabaoth, holds in His left hand a mountain symbolizing the virginal conception of Jesus by Mary, Jesus being the "stone uncut by human hands" of Daniel 2:34, considered in Orthodoxy a symbol for the conception of Jesus by Mary without human (male) intervention. Mary is the mountain, and Jesus is the stone cut from the mountain. The borders cleaned down to the gesso otherwise in an excellent state of original preservation. 11.75 inches x 9.75 inches (30cm x 25cm). 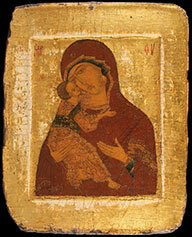 A BEAUTIFUL RUSSIAN ICON OF THE SMOLENSK HODIGITRIA MOTHER OF GOD, 17TH CENTURY. Here the Mother of God holds the infant Christ who delivers a blessing with his right hand and holds a scroll (signifying His wisdom) in His left hand. The borders and background overlaid with gilded basma and the heads of Christ and the Virgin encircled with gilded, enameled and gem set haloes from which hangs a similarly decorated tsata. The term Hodigitria (Odigitria) is a generic term that describes those icons in which the Mother of God gestures towards her son with her right hand. The term is based on the Greek and can roughly be translated as “Way-Shower.” In this case the one who shows the way to salvation-Jesus Christ. The Smolensk Hodigitria is said by tradition to have been painted by St. Luke and to have come from Byzantium to Chernigov when the Greek Princess Anna wed Vsevolod of Chernigov in the year 1046. About 50 years later it is said to have been gifted to the Cathedral in the city of Smolensk, from whence it takes its name. Eventually it was taken to Moscow (1308) but then returned to Smolensk (1456). Both the original and a copy were appealed to for success when the French troops under Napoleon invaded Russia in 1812 at the battle of Borodino. 12.25 inches x 9.5 inches (31.3 x 24.1 cm). 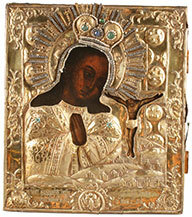 A FINE RUSSIAN ICON OF CHRIST THE LORD ALMIGHTY, MOSCOW ARMORY CHAMBER SCHOOL, CIRCA 1700. Here Christ is depicted seated upon an elaborate throne. He holds an open book of Gospels to a variant combining text from John 7:24 and Matthew 7:2, “Judge not according to the appearance, sins of men, but judge righteous judgment…” The central 18th century painted icon panel of Christ set into a later (19th century) surround and overlaid with a later, exquisite, heavy and ornate silver gilt multi-piece repousse and chased riza. Hallmarked Moscow, dated 1868, with 84 silver standard and indistinguishable maker's mark. 15.25 inches x 13.5 inches (39 x 34 cm). A SILVER GILT ENGRAVED DISKOS, GREEK, 17TH/18TH CENTURY. At center within a gilded circular reserve is engraved an image of the crucified Christ with corresponding Greek inscription, "He Apokathelosis" literally "The Un-nailing" the term used for the "Removal from the Cross,” referring to the removing of the nails when the body was taken down. Christ is depicted half-length upright in a sarcophagi, with the implements of the passion behind him (the cross) and flanking him, the spear (left) and the reed with sponge (right). The small devices equally spaced on the rim are likely designed to hold in place the asteriskos. The verso of diskos indistinguishably engraved in Greek, in one area, Georgiou Spatharikou, meaning perhaps “of Georgios Spatharikou." Diameter 7 inches (18 cm). 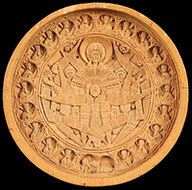 A VERY FINE AND RARE CARVED BOXWOOD PANAGIA “THE ROOT OF JESSE”, MOUNT ATHOS, PROBABLY 19TH CENTURY. Carved in miniature high relief, at center the Mother of God among angels and in the place where the Christ Child would normally be, is depicted a standing youthful Christ as a winged seraph (notice his feet projecting at the bottom and he is adorned with the cross-form halo). The borders are carved with figures in the ancestry of Jesus at left, and prophets who foretold him at right and all are carved amidst branches and leaves. The reclining figure at the bottom central section is Jesse, the father of King David and ancestor of Jesus, carved with the trunk of the "tree" coming out of him. The verso carved at center with a full length image of St. Nicholas identified by the incised Greek inscription. 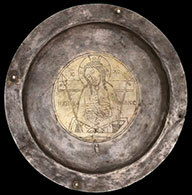 Likely once part of a two part hinged panagia or perhaps once held in a decorative metal frame. Diameter 2.6 inches (6.6 cm). A BYZANTINE BRONZE CROSS, 11TH CENTURY. 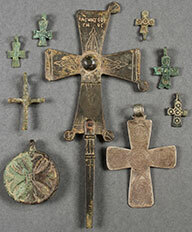 The bronze cross form with flared arms and the apices with spherical terminals (four missing) and the top of front section engraved in Greek Saint George and also incised with other decorative elements. Height 7.5 inches (19 cm). Together with a group of six bronze Byzantine baptismal or pendant crosses, 10th-11th century, and a probably much later Byzantine-style cross with integral suspension loop at top, possibly silver, height 3.5 inches (9 cm), together with a heavy later bronze Byzantine-style medallion pendant with raised cross. Eight pieces in all. 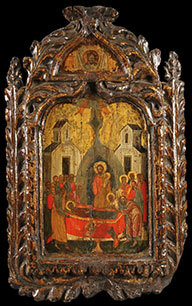 A GREEK OR CRETAN ICON OF THE DORMITION, PROBABLY 17TH CENTURY. Set within an integral carved gilt wood arched reserve and at top, within another reserve, the Holy Visage. 16.75 inches x 10.25 inches (43 x 26 cm). A BEAUTIFUL RUSSIAN ICON OF THE AKHTUIRSKAYA MOTHER OF GOD, ALEKSEI AFANASIEV, MOSCOW, 1778. Here the Mother of God is shown praying before a miniature crucified Christ. The lower margin inscribed, "The true representation and measure of the Akhtuirskaya icon of the Mother of God, which appeared in the year 1739, month of July, the 2nd Day." The original icon appeared on July 2, 1739, when the priest Danill Vasiliev found it in the grass while mowing with a scythe. In 1751, the icon was declared miraculous by the Holy Synod and soon after Empress Elizabeth donated money to help erect a church to house the icon, which accounts for the addition of the Imperial Double-Headed Eagle incorporated into the lower margin. It mysteriously disappeared in the first part of the 20th century and was reportedly returned in the year 2011 to the Novodevichy Convent in St. Petersburg, Russia by then President Dmitry Medvedev. The entire image overlaid with a heavy ornate gilded silver, repousse and chased riza embellished with paste stones and seed pearls. Hallmarked Moscow, dated 1778, and with maker's mark A.A., and the verso with old dedicatory dated inscriptions. 12.5 inches x 11 inches (32 x 28 cm). 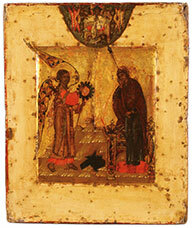 A FINE RUSSIAN ICON OF THE OLD TESTAMENT TRINITY, MOSCOW, PERHAPS PALEKH, CIRCA 1850. This icon depicts the three angels that appeared to Abraham at the Oak of Mamre as recorded in the book of Genesis, Chapter 18. The three angels are seated at a table, the Patriarch Abraham is depicted lower left and his wife Sara is shown lower right, both serving the visitors. In the background are highly stylized hills and a tree (the Oak of Mamre). Generally speaking the three persons of the Trinity are not distinguished by inscriptions, however some understood them thusly: Christ at center, above whom is a tree, signifying the wood of the cross, God the Father at left, before a building symbolizing the Church, and the Holy Spirit on the right, below a hill signifying spiritual ascent. The upper margin with inscription identifying the subject as, "Image of the Life-giving Trinity." Overlaid with a gilded silver, repousse and chased riza, hallmarked Tver, dated 1857 and Cyrillic maker's mark AP and 84 silver standard. 13 inches x 11 inches (33 x 28 cm).